1. Heat the oil and butter in a pan. Add the shallots and cook over a medium heat for about 8-10 minutes, turning, until browned on all sides. 2. Add the vinegar, sugar and herbs and bubble away until the liquid is syrupy. Pour in the red wine and leave to bubble again for a couple of minutes. 3. Add the stock and leave to simmer over a gentle heat for 30-35 minutes, until the shallots are soft and the liquid has bubbled to a syrupy sauce. 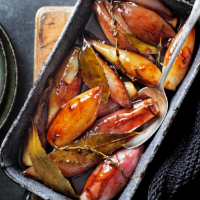 Season as you go, turning the shallots from time to time so they cook evenly, then serve.